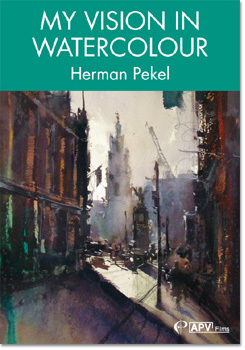 Herman is a very fine watercolourist, producing paintings full of atmosphere and light. 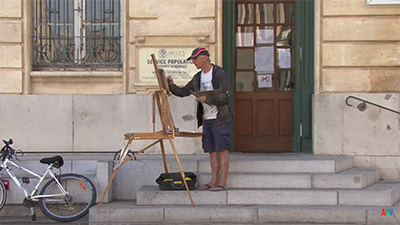 Painting ’en plein air’ he mixes traditional impressionistic values with versatility, with a strong emphasis on technique. 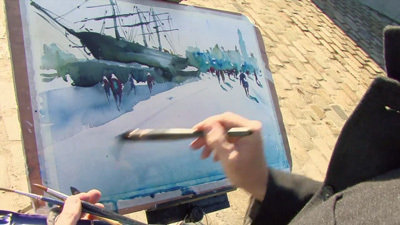 In this film Herman paints in London, firstly beside the river Thames near Tower Bridge, then a view looking down Fleet Street, with the sunlight producing strong lights and darks. 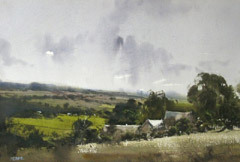 He then travels to the Cotswolds where he paints two views of the English countryside in summer. 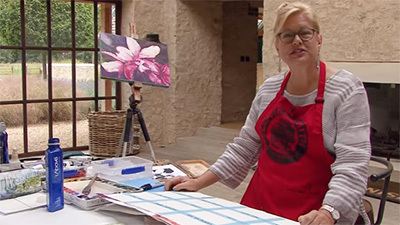 Aussie painter Herman Pekel brings a brilliantly matey approach to his second DVD, My Vision in Watercolour -so much so that it feels more like a chat over the garden fence than a practical masterclass. 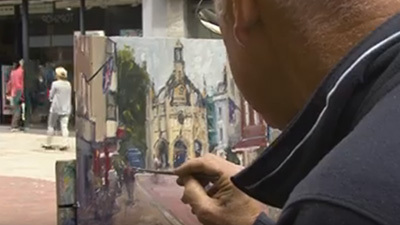 Nevertheless, his paintings of various London scenes and Cotswolds landscapes still give him the perfect chance to share useful tips on capturing light and building atmosphere. Herman Pekel is like a magician, maintaining constant connection with his audience, always engaging, and demonstrating impressive sleight of hand. Even as I watch him closely lay one wash over another, it sometimes seems a mystery that such an amazing atmospheric painting suddenly appears as if from nowhere! 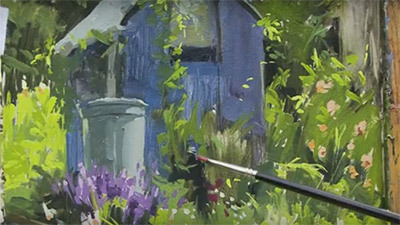 His new film, My Vision in Watercolour, reveals his unorthodox methods, through a set of paintings completed on location in London, and down in the Cotswolds. He places a lot of emphasis on drawing, which assists with the definition of details when colours are overlain. Viewers might be surprised to see him working from what is essentially a dirty palette to create lovely greys, and even spitting on the paper to lift the colour to create textural effects. 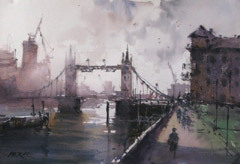 His first painting is of the Thames, looking towards Tower Bridge, where he advises viewers to decide what they want to achieve with their painting, and stick with it, even if the light changes. The wind dries the paint rather quickly, but Pekel lets the colours bleed into one another, creating softened relationships between the structural elements and the water. “Don’t force watercolour”, he advises, “let it do what it wants to do”. The view contrasts historic architecture with the strikingly modern shapes of new London, and he uses his trademark credit card to scrape back the paint, to create texture and definition. 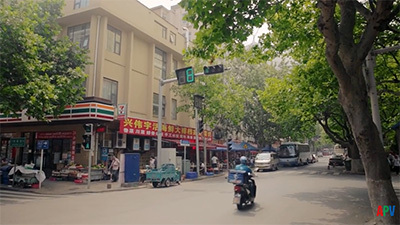 The sky is left almost featureless, so as not to detract from the shapes created by the buildings, whilst a final milky wash softens the harsher lines. He then turns his easel around, to paint the river from the opposite direction, this time making more of a feature of the sky, lowering the horizon, and painting the buildings, trees and rigging in silhouette. Moving away from the river, his third painting is a view down Fleet Street, chosen for the striking light, whilst the final two paintings are a complete contrast. Down in the Cotswolds, Pekel brings drama to the quiet landscape, exaggerating some of the smaller details, and calling on inspiration from Constable and Turner. 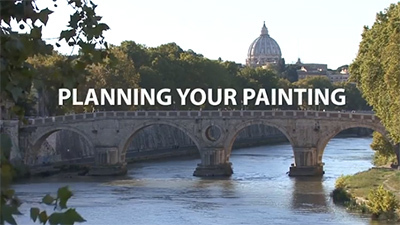 This is a highly enjoyable film, delivered with upbeat panache, that will give artists of all levels a wealth of ideas for adding energy and atmosphere to their paintings. I wish Herman would do more DVDs, he is brilliant! Herman's DVD is wonderful. It is amazing what he can accomplish with what looks like an Oil Brush Rigger. But the tools do not matter to a master. I greatly enjoyed the paintings and instruction. Thanks Herman for a tremendous dvd I thoroughly enjoyed every part of it.